The cocktail of Kollywood and Dravidian politics has ensured Tamil Nadu remains an intellectual backwater. Twenty years back when people asked me about my profession, I would tell them I was a writer. They demanded to know the police station I was posted at. It wasn’t just my close-cropped hair and the big moustache that convinced them I was a policeman. The police force too employs people designated as ‘writers’. Their job is to write out complaints and FIRs. Today when I introduce myself as a writer, the follow up question is inevitably about the film scripts I have worked on. I’m sure you can make out that a writer doesn’t have an identity in the Tamil society. The provocative French philosopher Jacques Lacan coined the phrase la femme n’existe pas about the non-existence of the sexual identity of a woman. In the context of Tamil Nadu I can paraphrase Lacan to say l’ecrivain n’existe pas or that the writer has no identity. Modern Tamil literature’s golden era spanned from the 1930s to1970s. Writer and journalist KP Rajagopal (pen name Ku Pa Ra) formed the Shakespeare Club in Kumbakonam in 1921 where every week writers met and discussed world literature. Works of writers such as Kalki (best known for historical novels such as ‘Ponniyin Selvan’) and Devan, a humour writer, were extremely popular among women back then. But today Tamil has shrunk to being just a spoken language. The written word is off-limits for most young people because they simply can’t read the Tamil script. Tamils have lost their reading habit. As a society we have become television ‘mega-serial’ addicts. I am considered to be a popular writer in the state. However, my fellow authors and I need nothing short of a miracle to sell even a 1000 copies. To put this in perspective, in China Jiang Rong’s ‘Wolf Totem’ has sold nearly thirty million copies. Why, even in neighbouring Karnataka, S.L. Bhyrappa’s new releases are eagerly awaited and copies fly off the shelves at such a pace that publishers have to go in for reprints with a week of launch. This cultural debasement started when Dravida Munnetra Kazhagam (DMK) came to power in 1967, eighteen years after the party was formed, thanks to their anti-Hindi agitations of 1965. That year, the DMK declared Republic Day as a Black Day. Congress was accused as anti –Tamil because of its pro-Hindi image, and people revolted against the Congress; the violence that ensued was uncontrollable. Nearly 70 people died. A few students set themselves on fire. That was the start of a vicious tradition which continues even today. When a politician loses an election or gets imprisoned, there are always some diehards ready for fire sacrifice. The irony here is that the DMK whose calling card was linguistic chauvinism, and provoked people against Hindi made Tamils turn away from their own mother tongue. I can think of two reasons why they succeeded. Fed on a steady diet of ethnic and cultural supremacy, the Tamil were bewitched by the tales spun by self-serving politicians. There was no language sweeter than Tamil, and no culture more ancient and glorious than that of the Tamils’. In 1968 the World Tamil Conference convened by then Chief Minister C.N. Annadurai attracted millions. It felt like Allahabad’s Kumbh Mela. M.Karunanidhi who succeeded Annadurai, erected scores of statues of Sangam era poets and personalities to celebrate the hoary Tamil civilization. The most notable among those was the statue of Kannagi on Chennai’s Marina beach, who was the lead character in ‘Silapathikaram’, one of the five great epics of Tamil penned in 2nd century AD. 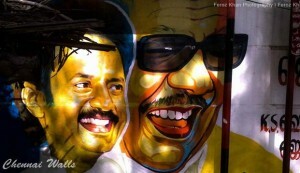 Chief Minister Karunanidhi was likened to the Chola kings and he lapped up every bit of such praise that came his way. Chola kings who conquered many Asian countries were honored in a grand ceremony. Wherever Karunanidhi went, there was a coronation of sorts. It became customary for Karunanidhi to be offered a crown of flowers – of course, India being a democratic country we were spared the sight of him being crowned with a real one. But this cultural degradation cannot be blamed on Karunanidhi or politicians of his ilk alone. It was a two-way street. The society had unquestioningly bought into the story of Tamil cultural exceptionalism. Dravidian leaders and their subjects praised and patted each other on the back so often that a bemused writer those days exclaimed, “Yes! The first ape was also a Tamil!” While the DMK kept itself in power, stoking ethnic pride and manufacturing tales of Tamil glory, Tamil as a language faced relegation. It began disappearing from private English medium schools and DMK’s policies ensured that a student could finish schooling without as much as basic proficiency in Tamil. Tamil Nadu’s education system produced youngsters who had proficiency in neither English nor Tamil. A Tamil film audio release function I attended recently, commenced with the recital of the Tamil Anthem (is there a place in the world where a language is worshipped in form of a song?). We dutifully stood up in attention. The film’s producer, director, music director, and most of the crew was Tamil, but spoke a variant of their mother tongue that was remarkably Anglicized. I think it is customary for the Tamils to pulverize their own culture first, then hold it up as something sacred and offer ritual genuflections. Being a writer in this society, I often lament, is like being a painter in a country of blind, or a musician among the tone deaf. I feel like a goldsmith in a country of beggars. The DMK’s role in making Tamil Nadu an intellectual backwater doesn’t end there. After DMK came to power, the Tamil Brahmins began moving to north India first, and then to North America piggybacking on the software boom. Hostility towards the Brahmins was virtually institutionalized. EV Ramaswamy or ‘Periyar’, the leader of the Dravidian movement instructed his followers at a public meeting that if they were to spot a Brahmin and a snake together, the Brahmin was to be dealt with first. The dream of Brahmins who got left behind in Tamil Nadu was to somehow reach the shores of America. Thus Brahmins began disowning Tamil and English assumed primacy in their lives. A community which was at the very apex of the social strata severed itself from Tamil society. Fifty years ago except for a few, all Tamil writers were Brahmins! Then we come to the role of Tamil films and its extension, television. 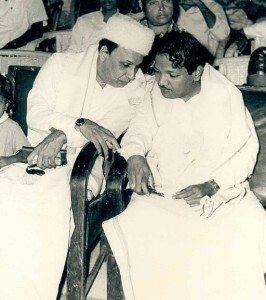 Dravidian leaders like Annadurai and Karunanidhi entered politics through films, and Karunanidhi still remains reasonably active in Tamil filmdom. During his stint as Chief Minister between 2006 and 2011 he continued to essay dialogues and scripts for films. Not a day ended without him attending a film-based event. Probably nowhere else you would see a society so obsessed with films. A friend who is a professor of French in Chennai was teaching her students the intricacies of the usage of prepositions in the language. When she asked a student to use the appropriate preposition for China, the student was unsure whether China was a town or a country. My friend observed that the same student possessed a staggering level of knowledge about film stars and their personal lives. Another friend who edits a Tamil magazine once received a parcel containing a severed human finger floating in a jar of formaldehyde. An accompanying letter from its sender said that he was hoping to be written about in the magazine which could be a ticket to meet a certain film star he worshipped. Then there was a moron who cut his tongue and offered it to Lord Venkateshwara of Tirupati so that his leader won the election. Camp and uncouthness now define Tamil popular culture. Here is a sampler. In a movie from a couple of years ago, where one of Karunanidhi’s grandsons plays the lead, a scene goes like this. The hero riding a two-wheeler stops at a traffic signal and looks at a girl whose face is covered with a dupatta. Hero tries to make a move on her. When the girl removes her veil to reveal her “unattractive” face(made worse by buck teeth), the hero spits on the ground in a display of revulsion and contempt for her. I cannot imagine a film elsewhere in the world containing such a sickening scene. Probably a Kim Ki Duk film might have such a sequence, but surely the man indulging in the act would perhaps be a portrayed as a psycho or a sadist. In our case here, he’s the adorable hero; even a prospective Chief Minister. 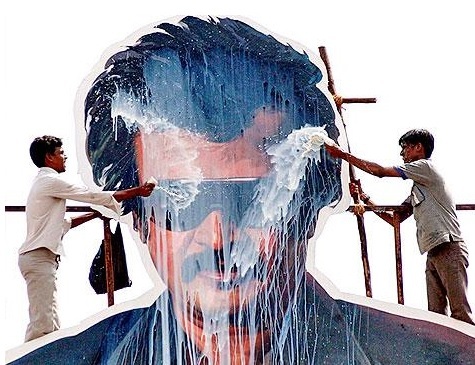 The propensity of Tamils to offer ritual libations of milk and honey (now beer, in keeping with postmodern times) to the plywood cutouts of stars and politicians is deserving of a serious sociological study. This culture of cutout abhishekam is yet another gift of the Dravidian parties to the Tamil society. Every film hero has fan club and the members of these fan clubs find themselves as vice-chancellors of universities and college deans, when their hero becomes a power player. 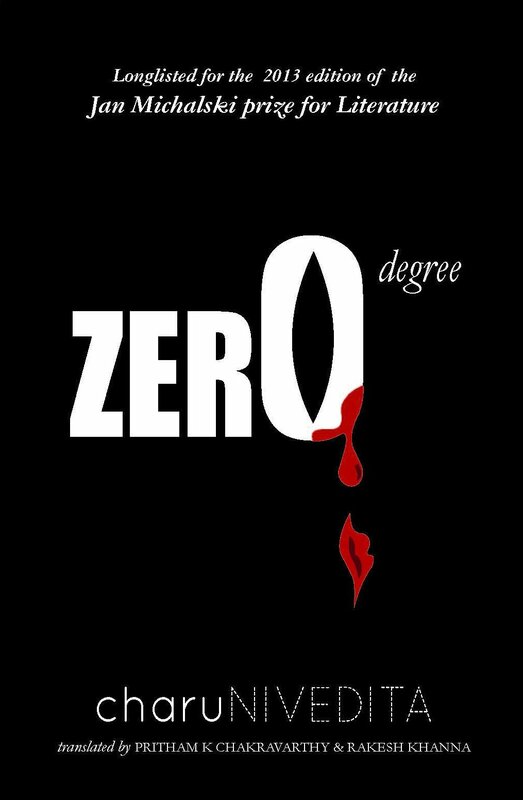 In any country, the state of universities and media are the barometers of cultural and societal maturity. But in Tamil Nadu these two institutions serve as an everyday reminder of our cultural philistinism. In magazines, a majority of the pages are crammed with cinema news; essays and columns are written by film lyricists; questions pour in for reader Q&A sections anchored by directors; and pictures of half-naked heroines can be found in every alternate page. The pages that are left are filled with pictures of woe-stricken Sri Lankan Tamils. Since most of the university vice-chancellors were errand boys of the film-star-turned-CMs, they indulge actors, directors and sundry celebrities by decorating them with honorary doctorates. Writers and intellectuals are damned. This class has to face disrespect and derision on a daily basis. A few years ago, a well-known French writer and I were invited to give a speech at a leading university in Tamil Nadu. We were ushered in to the VC’s office for a courtesy visit. The VC said he knew of me through my TV appearances. During our 30 minute interaction he showed no inclination to know about our works. He was keen on doing all the talking. What’s more, he would often pat the Frenchman on his thigh as though we were bosom buddies. My flustered friend felt that this kind of behavior would be frowned upon even at a bar table among friends, let alone strangers. It felt like that I was in a conversation with an unlettered auto rickshaw driver, not a VC of a university for half an hour. Robert Bresson, a French director made a movie based on Dostoevsky’s Gentle Creature in 1969. The hero, a middle aged money lender marries a poor girl. The girl is portrayed as being interested in Shakespeare and ornithology. The same novel was adapted for a recent film called With You, Without You by a Sri Lankan director called Prasanna Vithanage. Here, the heroine is a poor Tamil girl who is married to a Sri Lankan money lender. In a telling comment on contemporary Tamil society, the perceptive director shows the girl’s sole ambition in life as travelling to Tamil Nadu and meeting her matinee idol Vijay. Tamils living in any part of the world are the same. Only, for some, Vijay can be replaced by an Ajith, Kamal Haasan or Rajnikanth. The precise cultural difference between the Tamils and rest of the world is this. How can I as a creator of literary fiction, given this state of affairs and social milieu, reach a wider audience? Only translation could help; but we have a dearth of readers, forget competent translators. A friend of mine from north India publishes an English literary magazine where writers from all write. Except for a few original pieces in English, the rest are translations from Indian and foreign languages. I eagerly scanned the magazine for translations from Tamil. I was amazed to find a translation of Andal, the 9th century bhakti poet by a Tamil who works in a Japanese University as English professor. If a contemporary literary magazine is only now publishing the translation of 9th century poet, how many centuries will I have to wait to get my works translated? Published in the Swarajya, on September 16, 2014.